What are different Respiratory Organs? What is the role of diffusion in the Respiratory System? 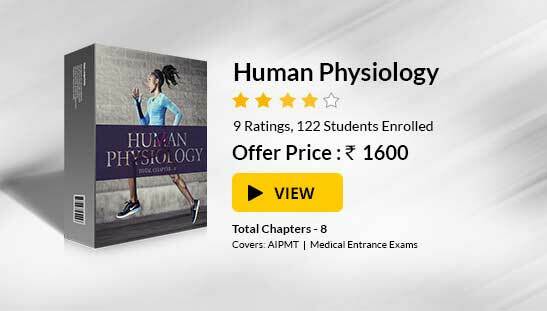 What determines the Partial Pressure of oxygen in blood? How Carbon dioxide and Oxygen are transported in the blood? Breathing and Respiration are two different words. Breathing is a process of taking in air and giving out air whereas respiration is a process of release of energy when a food/glucose breakdown in presence of oxygen. Respiration is necessary for the survival of the living organisms. 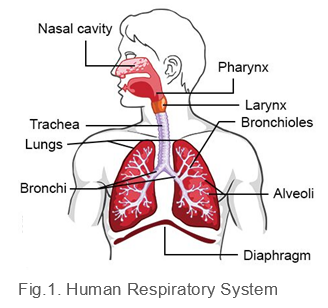 Different organisms have different respiratory organs for respiration. For Example: Lower invertebrates such as sponges, coelenterates, roundworms etc respire via process of diffusion through the body surface. Earthworms respire through skin. Insects respire through tracheal tubes. Aquatic animals such as aquatic arthropods, fishes respire through gills. Amphibians such as frogs respire through their moist skin. Diffusion is a process of movement of molecules from a region of high concentration to a region of low concentration. Diffusion helps in exchange of oxygen and carbon-dioxide between the lungs and the atmosphere. Nostrils is the first part of the respiratory system from where the air enters. Trachea also known as wind pipe filters the air that is inhaled. Trachea is covered by a lid known as glottis at the time of swallowing of food. It prevents the food from entering into the trachea. It branches into bronchi. Bronchi also known as air tubes pass air into the lungs. Bronchi branches into bronchioles. Partial Pressure is defined as the pressure exerted by the individual gas in a mixture of gases. Partial pressure of the oxygen defines the movement of the oxygen in the body. The amount of oxygen in the blood determine the partial pressure of oxygen. Breathing involves two processes: Expiration and Inspiration. Expiration involves expelling air out from the body whereas inspiration involves taking in of air. Inhalation involves the contraction of the intercostal muscles (muscles attached to the ribs) which expands the chest cavity. This increases the volume of the chest cavity and creates a pressure difference between the atmosphere and the lungs. This pressure difference/gradient causes air to move inside the lungs to fill this pressure. Expiration involves relaxation of the intercostal muscles which decreases the thoracic volume. This increases the pressure in the lungs due to which air rushes out of the lungs. About 5 to 8 percent of carbon-dioxide is transported by dissolving in the blood plasma. Carbon-dioxide bind to haemoglobin to form carbaminohaemoglobin. Haemoglobin is a blood pigment found in red blood cell that helps in transport of oxygen and carbon-dioxide in blood. When this carbaminohaemoglobin reaches lungs, carbon-dioxide is released into the lungs. This released carbon-dioxide can be expelled from the lungs via expiration. Most of the carbon-dioxide is transported in the form of bicarbonate ions. First of all, carbon-dioxide diffuses into the red blood cells and is converted into carbonic acid by an enzyme carbonic anhydrase. 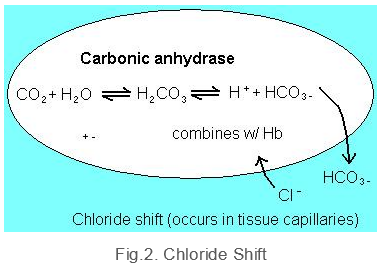 Carbonic acid immediately dissociates into bicarbonate and hydrogen ions. The bicarbonate ion formed is exchanged from the red blood cells with chloride ions. This is known as chloride shift. When blood reaches the lungs, the bicarbonate ion which is expelled from the red blood cells and binds with hydrogen ion to form carbonic acid which is converted back to carbon dioxide via carbonic anhydrase. This bicarbonate system acts as buffering system to regulate the pH of the blood. The majority of the oxygen is transported in blood via haemoglobin. A single haemoglobin molecule can bind 4 oxygen molecules. More is the partial pressure of oxygen, more is the affinity of haemoglobin for oxygen. The pressure in the Alveoli is known as Intra-Alveolar or Alveolar Pressure. It is measured with respect to atmospheric pressure.